Our institution is led by our Principal, Mrs. Amruta Prabhu and her core team which has several highly competent and experienced educators and childcare specialists. These influencers have combined their strengths to ensure that your child receives nothing but the highest quality of academic mentoring, focused guidance and enriched all-round development. An eminent and committed educationist, Mrs. Amruta Prabhu, has immense experience in teaching tiny-tots in primary and pre-primary schools. On the other hand, she has won much appreciation and accolades as a mentor and teacher to students of Secondary and Senior Secondary levels. An M.A in English, M.Ed and NET qualified, she has rich experience in a wide spectrum of CBSE and International schools. 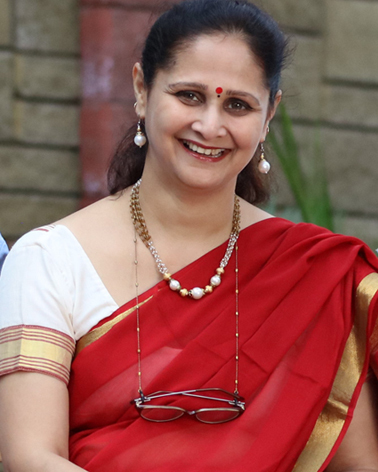 She has won laurels for her dedicated contribution as the founder Principal of the first CBSE ‘Í’(International) school of Pune. An alumnus of the Mumbai University, she has represented her State and University at several state and national level competitions whereby she has won plaudits for her immaculate oratory and presentation skills. Among her many accomplishments are the outstanding achievement award for the school from the Science Olympiad Foundation, lead organizer of National Level CBSE Inter School Science exhibition and a certified master trainer by CBSE for training English teachers of High School. With her robust and enriching experience of over two decades in teaching and administration, she believes in motivating her team to the fullest potential and leading her institution towards excellence in every sphere. Please complete all the fields in the form below or call us to book an appointment. We will confirm your request by an email / call. (M.G.Road and vicinity, Koregaon Park, Ghorpuri, Dhole-Patil Road and vicinity). "I declare that the information I have provided is accurate & complete to the best of my knowledge. I hereby authorize The HDFC School and its affiliates to call and/or send a text through the Short Messaging Service (SMS)."